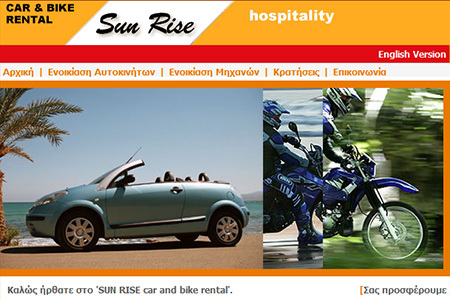 SunRise car and motorbike rentals in Heraklion is a company established in Crete for the quality and safety in rental cars and motorbikes offered. SunRise car hire in Heraklion is located near the Venetian harbor, but delivers the rented vehicles at all airports and harbors of the island, and hotels in Crete upon request. The car hire SunRise provides high quality and consistent, reliable advice for visitors and a wide range of rental cars and motorbikes that can meet every need, whether you are on a business trip, or spend your holidays in Crete. SunRise has new cars and motorcycles or vehicles in excellent condition. The company's fleet consists of user-friendly vehicles of all types, including small city cars, family and automatic, sport cars, jeeps and mini vans. The car rentals by Sun Rise are available at affordable rates that include unlimited mileage, full insurance, theft, fire, and road assistance service in the case of a breakdown all over Crete as well as baby seats and roof racks when requested. Take advantage of the competitive prices in hire cars in Crete, choose the model you want and let the experience of SunRise take you everywhere in Crete, with comfort, safety and economy.